But I also know sometimes you want your makeup to look effortlessly beautiful, natural and, well, kind of like you haven’t tried at all. You look amazing, but not like you tried to look amazing. You glow from the inside out — and just happened to spend 15 minutes in front of the mirror. I get it. Hell, I do too! Once you have the routine down pat, you’ll likely be able to do it in 5 minutes flat. But I thought I’d share some tips to help you along the way. Here are 5 tips to master the art of the No-Makeup Makeup Look (NMML). If you want to nail the no-makeup makeup look, your skin needs to look natural. I can’t stress enough how amazing the Nars Pure Radiant Tinted Moisturiser is for creating a natural flawless complexion. However if you do want something heavier, use a super-duper lightweight foundation. Opt for a matte foundation if your skin in oily, and a glow foundation if your skin is dry. But make sure you apply it lightly. You want to even your skin tone, rather than cover it up. If you have any spots or dark circles after you've applied your base, just lightly dab on some concealer and lightly blend. Remember to prep your skin before you apply your base, either with a moisturiser, oil, serum or primer (or a mixture!). A cream blush is ideal as it blends right it in and has a more natural look, but you can also use a powder blush. Just ensure you’re using a colour that’s going to suit your skin tone, and use it to a hape your face. If you have a darker skin tone, opt for raisin, terra-cotta, orange and fiery shades. Dark skin tones can play more with bright colours. Olive skin works well with orangey-peaches, roses and bronzes. Medium skin tones suit apricots and berry colours. Generally olive and medium skin tones suit most colours, as long as you’re playing to your undertones. If you’re part of the pasty-white-club (like moi, again) opt for a baby pink, peach or light plum. You want to keep it super light and muted, as blush can easily look fake and overdone on pale skin tones. When in doubt? Go peach. Peach blush generally suits all skin tones. Just apply a small amount of highlight to the tops of your cheek bones to accentuate your face shape. Remember that in your bathroom, it might not seem like a lot but it will when you hit sunlight. If you have eyebrow hairs, but they're thin (like moi), Benefit’s Gimme Brow is perfect for creating a more defined brow, without making it look too heavy or fake. Eyebrow gels are also great. 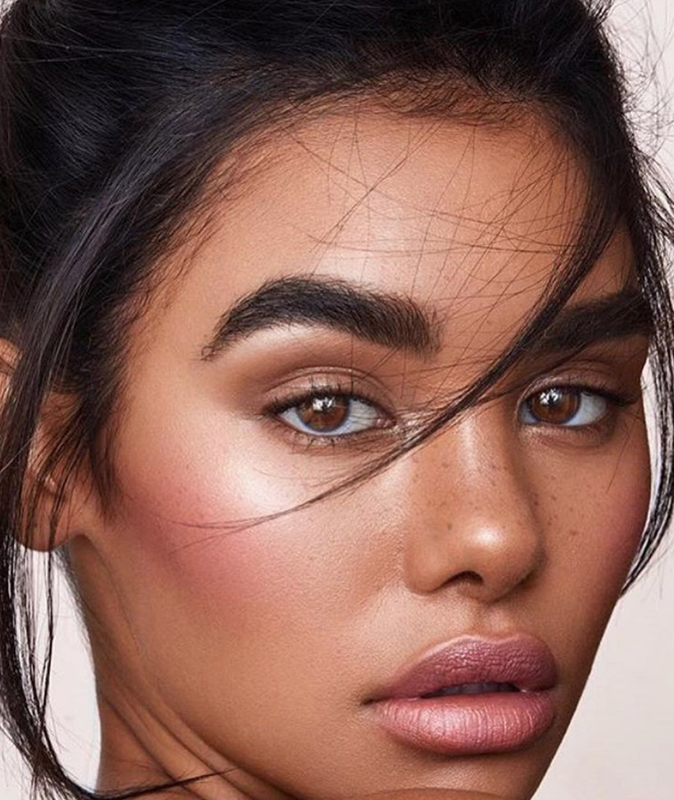 If you were a victim of the nineties thin eyebrow trend and need more, use your regular brow product but trying drawing on the hairs, rather than a line. (Benefit’s Ka-Brow is ideal for this). Another technique is to try drawing on the hairs at the start of your brow to and then fill your brow in. Try to avoid the defined square shape at the start of your brow. You’re aiming to make your brows look natural, rather than perfect. I also recommend brushing your brows upwards to see if that gives you a fuller looking brow. If it does, just fill in where it’s needed. When applying mascara, keep it to the top lashes ONLY. Make sure you apply mascara to the top of your top lashes (not just the bottom), and keep it super even. You want to look like you’ve just thrown on a light layer of mascara. I often apply mascara, then use a clean mascara brush to even it out. One of the quickest ways to brighten your eyes so that you seem awake/not hungover/like you got your full 8 hours is to apply a flesh or white coloured eyeliner to the inside of your eyes. It creates the illusion of wider eyes, by making your eyes seem brighter and clearer. Apply the flesh or white coloured eyeliner to your waterline (the inside of your lashes), and/or to the inside corner of your eyes. Do not use any black or brown eyeliners. I repeat, do not use any other eyeliner. We’re going for au naturel. Viola! You’ll look as though you put no effort in, despite impressively mastering the NMML.